That thing is going to be loud! Way way cool. We're gonna need videos and such, but of course. That looks awesome!!!! Can’t wait to hear it roar! You obviously don't have a dB rating for your roadworthy - love it. Theoretically, down under - below RHS Aus, we do. But nobody enforces it. YET. The stupid boy racers are probably about to wreck that. 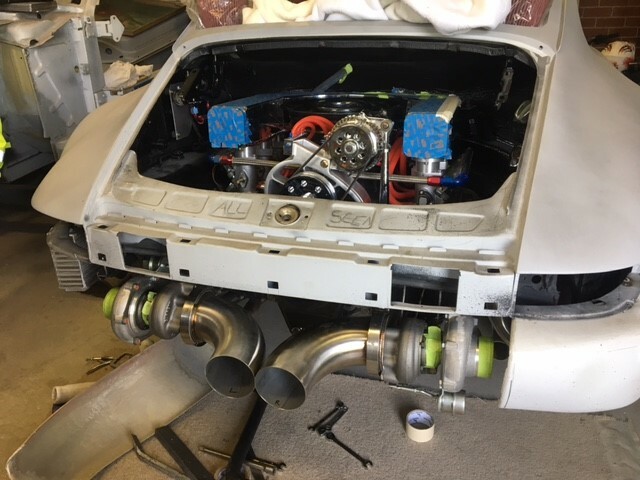 So its ok for a Porsche to have loud pipes, but not a Nissan? Or only the Grandpa racers? The twin turbos may quiet the harsh sounding exhaust frequencies a little and probably add a nice whistle that climbs with rpms. Is this going to have one big intercooler above the horseshoe manifold or two of them on the sides with fans drawing cooling air in from the wheel wells? Well, the number of porsches with loud pipes here you could prob count on one hand. The number of Nissans with loud pipes would be too numerous to count. But the real problem with them is their behaviour on the road. Midnight burnouts on the hwy intersections, shredding their tyres, pouring diesel on the road for a burnout pan etc. Then before the law arrives, off to wake up another neighbourhood. Hi all I will be running 2x intercoolers behind the bumper ends after the expence and detail I do not want to cover the flat fan setup.. I am also fabricating a 2 in 2 out small muffler set up with quick release v band clamps just to keep the law happy..